San Francisco, CA. Publisher: Ancient and Mystical Order Rosae Crucis.. Editor: Harvey Spencer Lewis (1883-1939). 1/1, March 1921-February 1924. Subscription contained in members' dues; five cents a copy otherwise. This was the next in the series of attempts by H. Spencer Lewis to found a successful journal for his Ancient and Mystical Order Rosae Crucis, and the first to be published from San Jose, California. On Harvey Spencer Lewis (1883-1939), see the note under American Rosae Crucis. 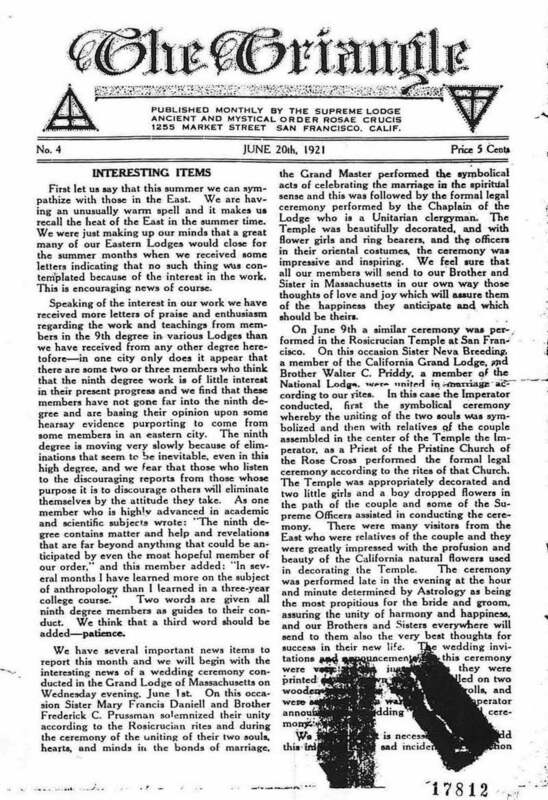 The first eight issues (March 1921 to January 1922) were in four-page newsletter format, and contained material on the doings and progress of the order, old "mystic" prayers, and the like. As stated in its first number: "Each issue will contain facts relating to the growth of the Order and its various Lodges in North America and other helpful ideas." The next issues (2/1, et seq., August, September and October 1923) were more ambitious, with 14 pages in magazine format and contributions directed towards the children of members. The journal was discontinued with 2/5, February 1924 and then revived in May 1925 as The Mystic Triangle. The bibliography of Lewis's early publications, including his journals, has been set out by David T. Rocks, "H. Spencer Lewis: A Bibliographical Survey," Theosophical History 6/6 (April 1997): 219-227. NYPL.